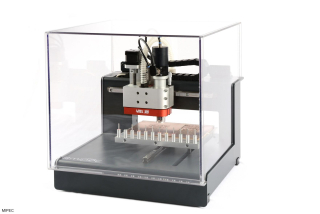 With a MIPEC 4MILL milling machine, you can produce PCBs in your own lab fast, environmentally friendly, and with high accuracy. You don't need to wait days or weeks for your PCBs from outside of your company anymore. With MIPEC 4MILL machines, you can proceed directly from the design phase to the implementation and testing of your design. Did you find any design errors? Doesn't matter, you can immediately produce a new PCB and run your tests again in a minutes. It means that you can reduce your time to development, and you are no longer dependent on outsourcing. 4MILL machines can give you more! They are multipurpose machines, suitable for different jobs in an electronic lab. Their precission makes them suitable for producing high resolution PCBs. 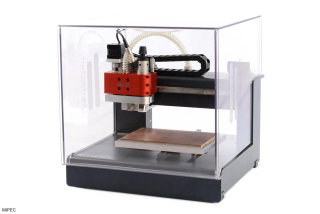 All of our PCB milling machines can mill insulation tracks with widths down to 100um, and they can easilly drill holes as small as 0,2mm Thanks to our advanced software, these machines are also popular in HF labs. Especially in this regard, the possibility of producing dozens of prototype PCBs a day is highly appreciated. No matter what you have in mind - power boards, flexible PCBs, double sided, or complex shapes - 4MILL machines can process and produce it for you. And that's not all: 4MILL milling machines have much more to offer. Thanks to its flat milled aluminim table with central T-groove you can transform these machines into extremely accurate CNC table milling machines suitable for extremely fine machining. This makes standard jobs, such as making holes in electronics enclosures and producing front panels very easy.